Visiting near Boston Mill Visitor Center? Gene just might be nearby. As a frequent wildlife watcher near the center, he often welcomes visitors with a smile, a wave, and answers to any questions, including one of the most common: what should we see and do? As the unofficial greeter, Gene helps his visitors create their own extraordinary days with tips and advice on where to go. When those visitors have kids with them, he’s especially excited to give advice. Gene recommends families with children visit a few key areas, especially Beaver Marsh or the Boston Run Trail for a great beginner experience. “You want to give kids a short introduction to the park, so they want to experience more. I’ve seen kids dragging on trails, and that’s no fun for anyone. 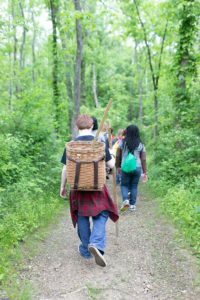 But if you give kids a quick hit and expose them to the natural wonders, they want more.” Other great beginner trails he recommends are The Pine Grove Trail or part of the Ledges Trail from the Octagon shelter. Gene also suggests picking up a guide in the Visitor’s Center with information on Junior Ranger programs. Many of these are offered through the Cuyahoga Valley Environmental Education Center – another hidden gem within the park. The Education Center is the home base for educational experiences within the park. Programs occur on its 500-acre campus and throughout the park, including programs for Scout troops, school-sponsored field trips and the open-to-all Junior Ranger Programs. The Conservancy raises funds for scholarships so that all children may attend programs at Education Center.